A scaled claim based on the date of commercial availability of a CPU microprocessor with a clock speed of 15.0 GHz or higher. 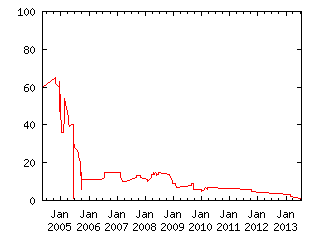 The claim value is based on the date of commercial availability, beginning with a value of 1.00 for January 2006, and declining by 0.01 per month. If a 15.0 GHz processor becomes available before January 1, 2006, the payoff will be 1.00. If a 15.0 GHz processor does not become available until after April 30, 2014, the payoff will be 0.00. A chart showing actual payoff values for each month is shown at the bottom of this description. Note that higher prices correspond to earlier projected release dates. If you think that the current price projects too early of a release date, you should sell - if you think the projected release date is too late, you should buy. I will judge this claim based on the commerical availability of the first 15 GHz or greater microprocessor released by *any* chip manufacturer.